New research just published will help astrophysicists understand the formation of jets of matter ejected from supermassive black holes. This, in turn, will help understand conditions in the early universe, when such phenomena were much more common than now. The galaxy M87 is one of the strongest sources of radio waves in the sky. Its black hole, accretion disk, and radio jet have been studied in the past, but it has been difficult to pin down the relative positions of the black hole and the base of the jets. 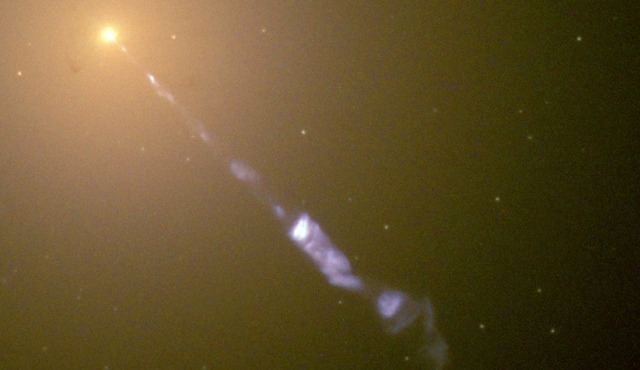 Until now, at least: in today’s Nature, scientists report observations that map out the shape of the jet and, from that, extrapolate the position of the black hole—the two appear to be much closer than in other galaxies.